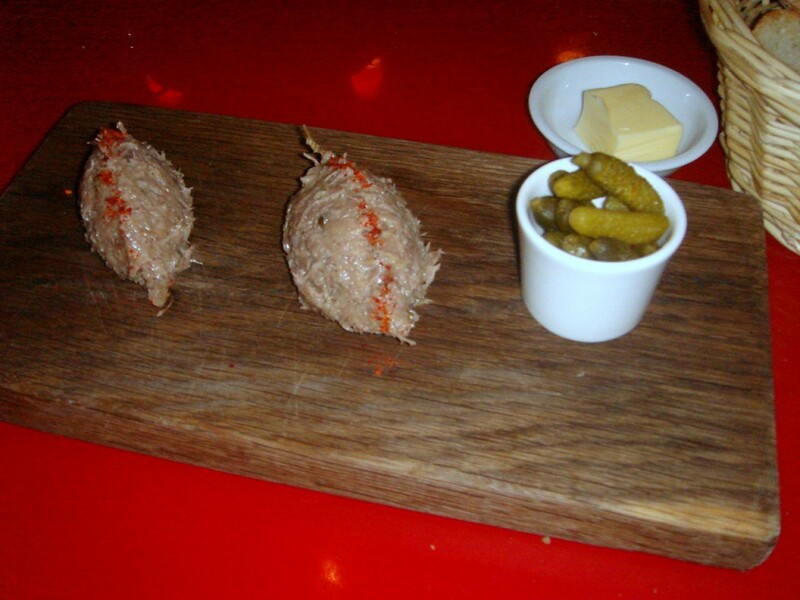 A serving of rillette (£5) comes with two generous scoops (in the selection of charcuterie you only get one scoop along with the pork terrine and the saucisson). This was as delicious and rustic as I remembered – creamy and rich with velvety duck fat. 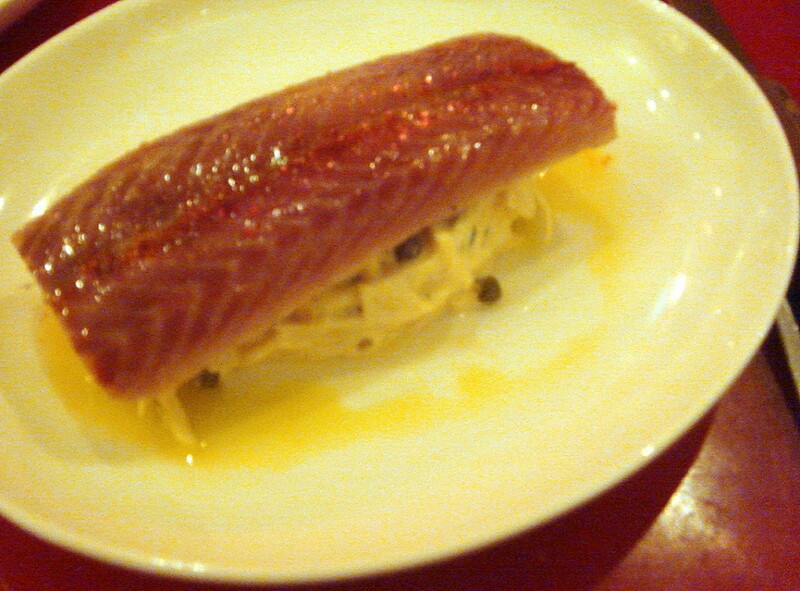 The smoked eel did not disappoint either. Meaty with a lightly smoked flavour, it was nicely balanced by the creamy chunky rémoulade (£8). We also ordered the piperade Basquaise with chorizo (£9) again. The eggs tasted as creamy and sweet from red peppers as last time, although the portion of chorizo was a little smaller this time. 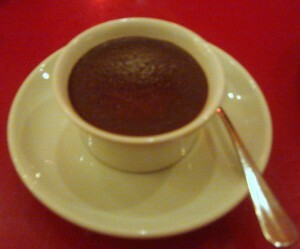 A dessert of bitter chocolate pot (£5) was sheer heaven. A little heavier than a chocolate mousse, it was chocolately, rich and creamy; and it delivered the perfect balance between sweet and bitter. This was the best of all the desserts I have had here so far. 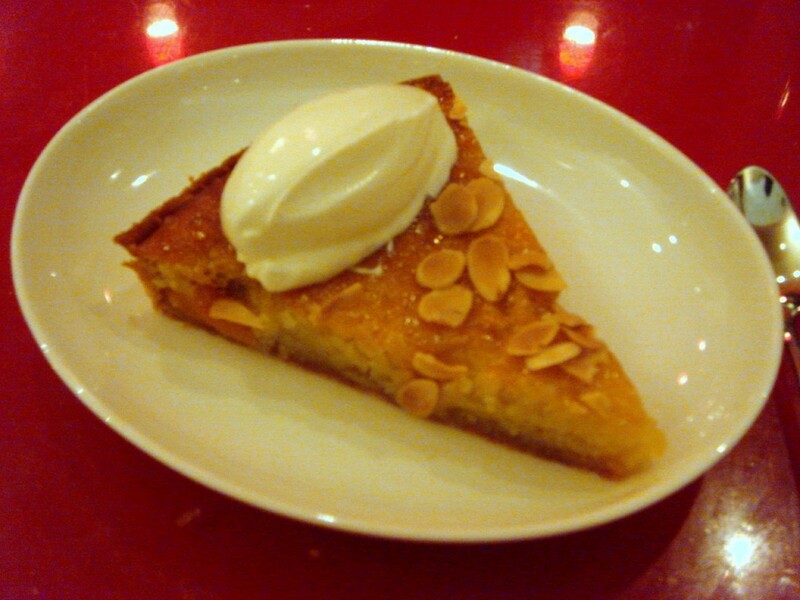 An apricot and almond tart was pleasant (£5), although I found the filling to be a little too moist. It was soggier than the Agen prune and Armagnac tart that I tried previously. On the wines, Terroirs offer what are known as natural wines. A wine is termed as ‘natural’ if they are made with minimal intervention. This can either be in the way the grapes are grown (eg, bio-dynamically), or in the method by which the wines are made, for example, without the addition of chemicals such as sulphur dioxide. Wines at Terroirs are predominantly sourced from France, and are carefully selected from smallish boutique wineries. It’s worthwhile noting that ‘natural’ wines are not necessarily organic wines. You can read more about it on The Wine Sleuth’s blog post on Terroirs. Service was as efficient and effective as on my previous visits. But where I did better this time around was to request a table on the upper level of the restaurant when I made our reservation. Terroirs have both an upper and a lower level, plus seating at the bar, and on pass visits, I sat on the lower level where I found it to be a little claustrophobic and noisy. On the upper level, it is slightly more spacious, and the noise levels are more contained. Although some might say it’s less buzzy, it made for a much more relaxed environment and I found it easier to chat for I no longer had to shout to be heard. There’s still much more from the menu for me to explore, so watch this space for another ‘return’ visit. This third visit has reassured me that the food at Terroirs is reasonably consistent. Sure, the pork belly that I had before was a little bland, but some of the dishes are exceptionally tasty and very well priced for this part of London. On this point, prices seem to have remained pretty much the same as my last visit. There were no notable price increases other than the selection of charcuterie which has gone up from £9 to £10. Price range – About £21 to £31 for a small plate, main and dessert. Excludes drinks and service. The smoked eel looks intriguing and I would so love to have that chocolate pot right now! Very nice! Hi natasha, if you get the chance, do try the chocolate pot. Hi Gourmet Chick, I think for what they charge, the location and the quality of the food you get, its a good find! Oh yummy, I love Terroirs too, had a great visit and am keen to return again and again. Hey did you read AA Gill’s review on it by any chance? I can’t believe he panned the place, even though he noted that the food was good, but he gave it 3/5 because he didnt like the idea of ‘french tapas’. Rebecca, I hope you do try the eel. For my part, I love the stuff! Kang, AA Gill pans a lot of places! I don’t think you can take his writing too seriously. For me, its more about entertainment. But that part of about panning it because its ‘French tapas’, that’s a bit silly.